And yet little did we expect what Jekyll + Hyde turned out to be. Putting it simply, despite how much I liked the record it was a mess, full of stylistic pivots into rock, metal, reggae, EDM, and even occasionally country music! And again, there were great moments - Zac Brown has a knack for hooks like few in mainstream country - but the pileup of genres alienated a lot of the group's fans, especially those who had followed from their loose, jam-band roots. And again, even though I did like that project and think their experimentation did occasionally stick the landing - I hold 'Tomorrow Never Comes' is as close to a country/EDM mix that actually works that has ever been made, and the rock-leaning tracks definitely have their fans - for a lot of country fans it was a step too far. And so in the lead-up to Welcome Home, you can tell they were doing everything they could to re-establish their country credentials. Zac Brown himself contributed to a song on Dave Cobb's Southern Family compilation - which I still hold is the best album of 2016 - and apparently they connected so well Dave Cobb was pulled on to produce the entire new record. And despite this reassuring step, I was still a little concerned - I wasn't against Zac Brown experimenting, he had stuck the landing a fair few times, I just wanted the cohesion to be there and the songwriting to connect. But hey, if we're going to get a solid, grounded country record, this is something the Zac Brown Band can do well, so what did we get? Honestly... I have to say, I'm a little underwhelmed by this. Don't get me wrong, it's not a bad project, but the more listens I gave Welcome Home the more I was utterly convinced it was a safe project, the sort of album used to placate country fans without really challenging them or stepping into territory that the Zac Brown Band hasn't touched before - sometimes even more than you might think, but we'll get to it. But it's also the sort of album that doesn't give me a lot to say either - pleasant, but generally tepid, and not close to hitting the heights for which they're capable. But look, it's important to stress that as a whole, the Zac Brown Band are still a compelling group. Warm acoustic guitar, solid bass, piano, some beautiful fiddle work, touches of organ when it's needed, and Zac Brown's huge voice to back it all up. And look, it's easy to be sucked in by that, it's familiar and comforting, especially as you can tell Dave Cobb is letting all that warm richness swell through in his producton... about the only distinct contribution he makes to this record, outside of giving the fiddles some beautiful tone on songs like 'Long Haul'. But if you're coming in expecting any of the rough edges that have occasionally cropped on previous records, or even the dramatic swell that anchored some of their most powerful songs... well, you're not getting it, and the level of polish on display doesn't exactly help make songs like 'Family Table' feel any less schmaltzy, or the blocky percussion buried inside 'Start Over' sound any less like one of the least inspired island songs they've ever cut, or how the melody line of the hook on 'Your Majesty' might have been imported straight out of 'Homegrown'. Now that's not saying there aren't good songs here - the cover of John Prine's 'All The Best' is passable, even if that odd little tap they let through gets distracting, 'My Old Man' has real weight in the chorus harmonies, and '2 Places At 1 Time' is easily the strongest cut with a good hook and one of the richer vocal arrangements - but as I referenced when I covered Chris Stapleton, when you're releasing a ten song record that's barely over a half hour, you don't exactly have room for filler. But if you're going to highlight where that becomes an issue, it's in the writing... and look, as much as I love Southern Family, I think Zac Brown may have missed the point of that record beyond his collaboration - sure, it told those down-home, family-centric stories, but the larger themes of the album were focused on darkness and death in that family, and trying to find reconciliation with that fact - it had weight because those deaths and family dysfunction was described with a sense of grounded reality. 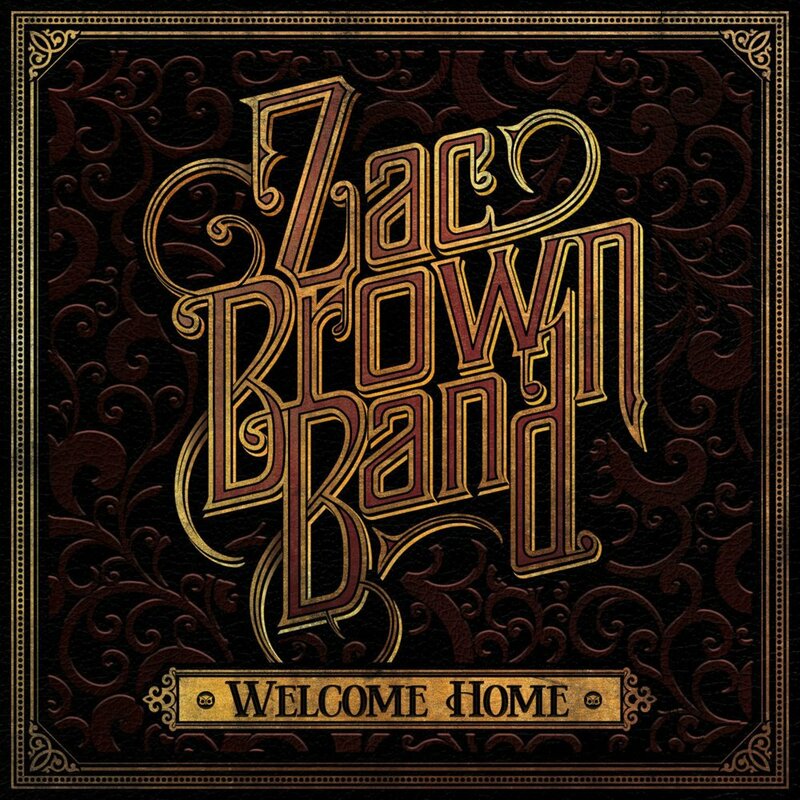 Whereas with Welcome Home, Zac Brown seems much more driven to capture an idealized down home family experience that appeals to everyone - and paradoxically, it feels a lot less relatable. Here's how broadly populist he's aiming: when calling back to the roots he feels whenever he plays to keep him grounded, the song he uses to bring people together isn't a country track, but 'Don't Stop Believing' - seriously. '2 Places At 1 Time' at least reflects a little wistful longing to be both at home and on the road - although Dierks Bentley's 'Damn These Dreams' and Brad Paisley's 'Southern Comfort Zone' both did more with the concept, but it's immediately followed by 'Family Table' and again, given the Southern Family connection it's hard for me to not compare this with Jamey Johnson's 'Mama's Table', which is a far better song! Then there are the two tributes to his father, and I have to say, at least 'My Old Man' has some resonance opposite all the flag-waving on 'Real Thing' - because whiskey, songs, and women ain't real if they aren't from America. And I haven't even gotten to the songs about women - sure, on 'Long Haul' he's committing long term despite his failings, and 'Your Majesty' is a sincere if a tad hyperbolic for a love song, but when you follow that with 'Trying To Drive' - which yes, anyone who has heard the Zac Brown Band's live album will know this is an old song from 2010... yeah, I dig the fiddle and rougher electric pickup against the organ and Aslyn's slight rasp opposite Zac Brown works well, but it's a song about the couple wrestling for the wheel to drive the relationship which implies one person has to get to the side... well, outside of how the second verse makes the implication heavy that it's the guy whose taking over this relationship because the girl is out of touch, I really think a song like this needed more details to stick the landing. But that's part of the problem - outside of broad sketches, on the majority of these songs we don't get those details, and when we do, like on 'Start Over', it only serves to highlight a dead relationship that no beach vacation with Corona is going to revive - this is borderline Rupert Holmes' 'Pina Colada Song' clueless! Look again, this isn't a bad project, but what's more galling is that it's not really all that memorable or interesting, and I know the Zac Brown Band are capable of better - Uncaged was easily one of the best country records of 2012, and they've churned out some fantastic singles I still sing to this day - and again, Jekyll + Hyde may have been a mess, but it at least had character and took chances. This doesn't, and combined with the flagrant recycling, I can't say this is more than decent, netting a strong 6/10 and a recommendation pretty much just for fans. But Zac Brown Band fans will have heard nearly all of this done before and done better, so I'd take a few decent songs and move on - if this is the country placation you want, enjoy, but I know they have the potential and can do more, and I want to hear it.